4. 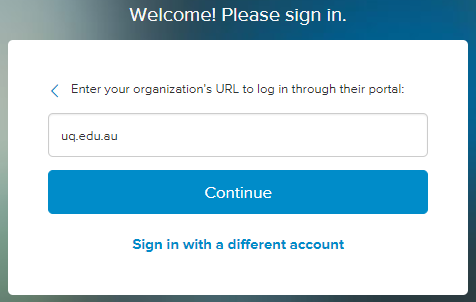 Type “uq.edu.au” in the “Organization’s URL” box and click Continue. 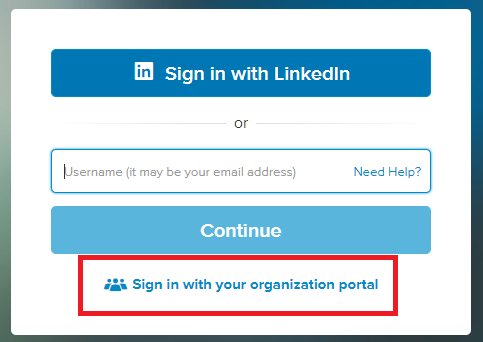 NOTE: If you are logged on to a UQ computer, you will probably be logged in directly. If you are on a personal computer, you will be redirected to a UQ log in page, using your normal s1234567 student number and password. There are two easy ways to filter your searches on Lynda: Videos and Courses. You can search for specific tasks, such as “Crop image Photoshop”. To find these, type your search and filter by “Videos”, in the left-hand column. This will give you videos usually only a couple of minutes long. If you are looking to learn a whole program, such as InDesign or Audition or Photoshop, type the name of the program and filter by “Courses”. Courses are divided into Chapters which will guide you through the software step-by-step. These can be several hours long, but are very comprehensive and simple to follow. Most Courses will have downloadable Exercise Files, included with the Premium package UQ students can access for free. It is a good idea to download these (under the Exercise Files tab, below the video player). Specific files for each exercise will be displayed on screen at the beginning of each video.